Most of items are available here.Here is best ,easy,tasty,delicious,spicy and healthy recipes, Its Easy Recipes. First take milk in a pan and keep it to boil on a low to medium flame. I used organic cow milk which does not have much fat. If you use buffalo milk, it has too much of fat and makes a thick layer of cream floating on top. You have to remove the thick layer of before you proceed with the making of Chena. When the milk is heating up, line a strainer or bowl with a cheese cloth or muslin. Keep on stirring the milk at intervals so that the froth is not formed on top and the base does not get browned or the milk solids get stuck to the bottom. When the milk comes to a boil, then reduce the flame to its lowest. Add 1 to 3 tbsp lemon juice. First add 1 tbsp lemon juice and stir. If the milk has not curdled completely, then add 1 tbsp more. Keep the lemon juice handy with you. Depending on the quality of milk, you may need to add 1 to 3 tbsp of lemon juice. Stir after adding the lemon juice. Sometimes I have added 1 tbsp lemon juice and the milk have curdled and sometimes I needed to add 3 tbsp too. Vinegar also can be added instead of lemon juice. Another option is curd/yogurt. Add 4 to 5 tbsp of yogurt or more if required. With yogurt you don't need to rinse the Chena in water later. And as soon as the milk curdles, switch off the flame. The milk should curdle completely with the green watery whey. If the milk does not curdle, then add ½ to 1 tbsp of lemon juice more. And now pour the curdled milk in the cheese cloth/muslin lined strainer or bowl. Gather the muslin from the sides and rinse the Chena or coagulated milk very well in running water. This brings down the temperature of Chena as well as removes the lemony flavor and tangy taste from the Chena. Now squeeze the muslin with your hands very well, so that excess water is drained from the Chena. 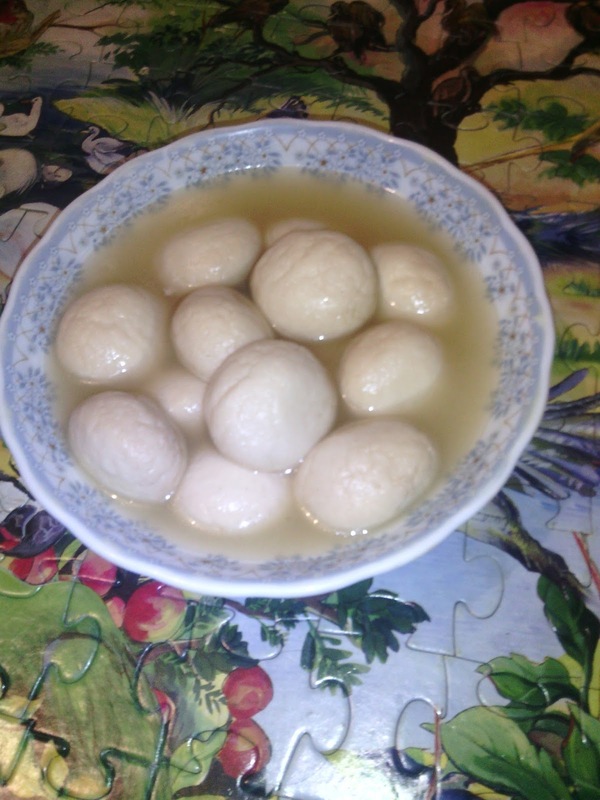 Remember there should not be excess water or moisture in the Chena as then the rasgullas will break when cooking. Place a heavy weight on the Chena for 7 to 8 minutes. You can also hang the Chena for about 30 minutes. After 8-9 minutes, remove the cheesecloth from the Chena. Note that the Chena should not have too much moisture nor be too dry. Add 1 tsp shoji. You can also add all purpose flour. Adding either of them helps to bind the mixture. For a gluten free option, add corn starch instead of semolina or all purpose flour. First mix the shoji with Chena and then begin to knead. With the heels of your palms mash the Chena and knead. Keep on collecting the Chena from the sides and continue to mash and knead. This kneading process is very important and also decides the texture of Chena. When you feel your palms becoming a bit greasy, its time to stop. just a bit of greasiness is required. Avoid kneading to an extent where the whole Chena becomes greasy. I kneaded for about 10 minutes as I have very light hands. So depending on the quality of Chena and the pressure you apply while kneading, you can take more or less time. Note that the Chena should just begin to get greasy. Knead to a smooth ball of Chena. 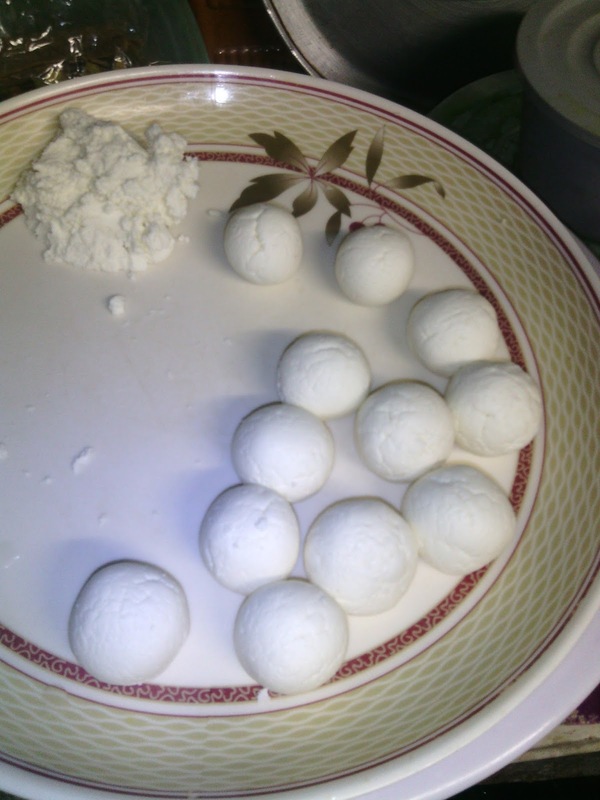 Now pinch small portions from the Chena and roll them between your palms to a smooth round ball. Prepare all small balls this way. Cover all the Chena balls with a moist muslin or kitchen towel and keep aside. In a large pan, take 2 cups sugar and 4 cups water. 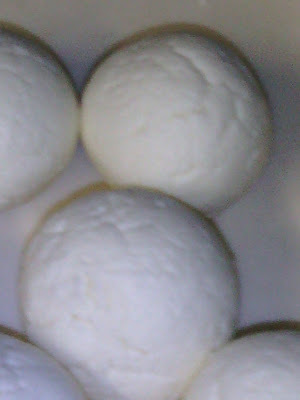 You have to use a large pot or pan so that there is enough space for the rasgullas to cook and increase in size. You can also use a pressure cooker. I used a pan measuring 8 inches in diameter and 4.5 in height. A 4.5 liter stainless steel pan. Keep this pan on stove top and heat the sugar solution. Stir so that the sugar dissolves. I cooked kneaded the Chena and cooked the sugar syrup simultaneously. You can also do this way. Once the sugar solution becomes hot, the impurities begin to float on the top. You can either remove it with a spoon. Or strain the impurities in a cheese cloth/muslin lined strainer. Now from the purified sugar solution, reserve 1cup in a cup or mug. This 1 cup of sugar solution we will be adding to the cooking rasgullas. Reserve another 1 cup of the sugar solution in a serving bowl. The rest of the 2.5 cups of sugar solution you add it back to the large pan and bring it to a boil on a medium high flame. Slid the rasgullas gently into the sugar solution. Once all the rasgullas have been added to the sugar solution, shake the pan. Don’t stir the rasgullas with a spoon. Just gently shake the pan. Now cover immediately with a lid and let the rasgullas cook. Keep the flame to a medium high. And after 5 minutes, open the lid and add 1 cup of the reserved sugar solution. Shake the pan. Adding this reserved sugar solution ensures that the temperature & consistency of the sugar solution is maintained and the sugar does not cook to its thread consistencies. Cover again and continue to cook. After 5 minutes, again add 1/3 cup of the reserved sugar solution. Cover and again cook for 3 minutes. I cooked for 10 minutes. Once the rasgullas are cooked, switch off the flame and keep the pan down. Now take each rasgulla with a spoon and place it in the bowl containing the 1 cup of sugar solution. Cover and keep aside. Now let the sugar solution in which the rasgullas were cooked, become warm. Then add this to the serving bowl containing the rasgullas. Once the whole mixture has cooled down, add 1 to 2 tbsp rose water. If you don't have rose water you can also ½ tsp cardamom powder. Stir gently and allow the rasgullas to be soaked in the sugar syrup for 30 minutes.